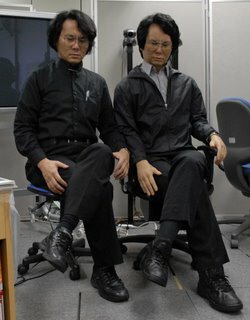 This episode covers android science and human-robot interactions with expert Hiroshi Ishiguro from Osaka. After the interview we feature the last installment of Jack Graham’s Selkies story, as well as a poll on the future of Androids. Hiroshi Ishiguro is Professor of the Department of Adaptive Machine Systems, and the group leader of the Intelligent Robotics Laboratory at Osaka University. If you’ve ever seen an Android robot in the news, it probably came out of the Intelligent Robotics Laboratory. Starting from the robotic replicate of his then 5 year old daughter, Prof. Ishiguro then went on to model a female android after Ayako Fujii, the NHK news announcer. Finally, his latest robot Geminoid, which is a close copy of himself, is able to replace its creator in lectures and interviews. His robots are highly actuated to give them human like facial expressions and reflexes. However, because the AI needed to interact in a human-like manner is not always advanced enough, Prof. Ishiguro has been looking to partially teleoperate his robots. Another approach investigated is to make his robots autonomous by having them perceive and react to their world thanks to networks of cameras and microphones. Using these robots as a tool, Prof. Ishiguro has been exploring the field of Android Science, which looks at both the appearance and behavior of humanoid robots and their impact on human robot interactions. In particular, he is looking to verify the existence of the uncanny valley and to explore how to make androids which sufficiently resemble humans to be likable. On the more philosophical side, his androids open the door to understanding what human presence really means. What is your take on androids? Will androids ever become indistinguishable from humans, both in looks and behaviour? Will they become unrecognizable like the Cylons from Battlestar Galactica, or remain awkward like Data from Star Trek? Take the poll on the Robots forum! housemaid, Australia’s anti IED robot SPIKER as well as videos and a slideshow of 25 years of CMU’s Field Robotics Center.